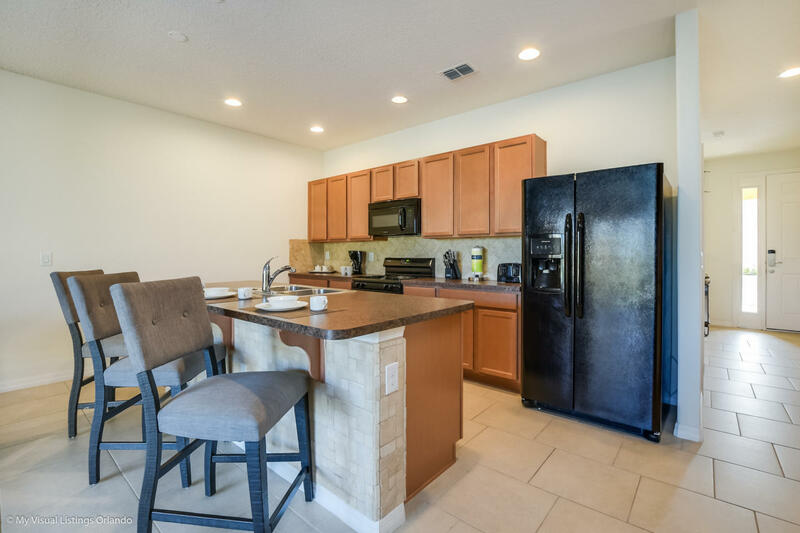 On top of all the incredible on-site amenities, Solterra is just minutes from Disney and Universal and close to dining and shopping. 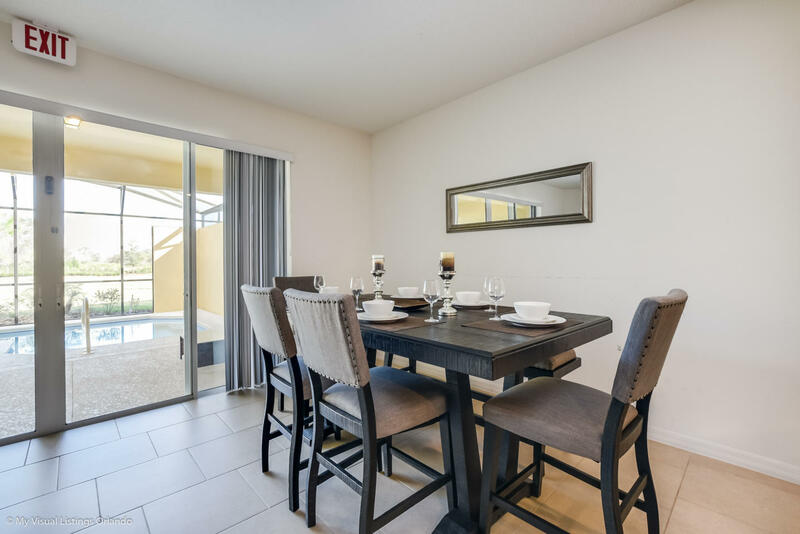 Everyone will want to gather in the open living space, where the kitchen, living room and dining space flow together. From movie marathons to board-game nights, the living room has a plush leather sofa, large ottoman and flat-screen TV. Plentiful Florida sunshine awaits on the back patio, where you can take a relaxing dip in the pool or lounge on the pool deck. center island with seating for three. Just off the kitchen, an open dining area seats six around a rustic high-top table with views of the pool. Sumptuous bedding perfectly complements the master bedroom’s king bed with black leather and wood headboard. Along with a tray ceiling and nice-sized closet, the master also has a en- suite bathroom with double sinks and walk-in shower. Large windows fill the second bedroom with tons of natural light. This bedroom also has a king bed and en-suite bathroom with double sinks and walk-in shower. A mix of swanky and simple, the third bedroom has high ceilings and two oversized twin beds with posh headboards. The fourth bedroom comes with a queen bed and nice-sized closet for extra storage space. Upstairs is another full bath with double sinks and tub/shower combination, plus a laundry room with washer and dryer. 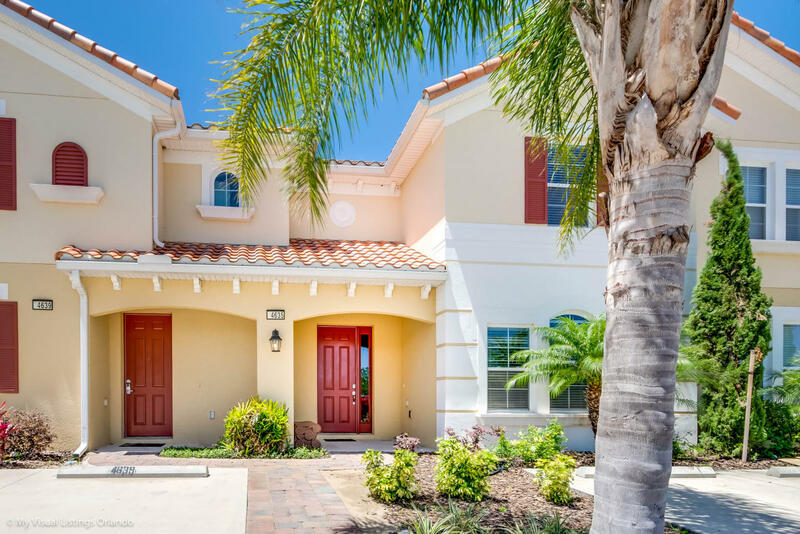 As a guest of Solterra Resort, you have access to a resort-caliber pool plus an amenities center.The home has easy access to Interstate 4, so you can be at Walt Disney World in less than 20 minutes and Universal Studios and SeaWorld in 30 minutes. Plus, there are tons of dining options, retail stores and two grocery stores just five minutes away. I was pleasantly surprised with our rental. Everyone enjoyed the property. The kids enjoyed the private pool, they got in it everyday. More than enough room for all of us. We didnt do much cooking but the kitchen was equipped with the neccessary appliances and all the cookware incase we decided to cook. Abundance of towels. The only thing I would say is I wish that the pool was heated without a extra fee. Also, I'm a travel agent I wish someone would have gotten back with me about the question asked about if they gave travel agent discounts or not because I would have loved to pass it on so other agents could get the chance to experience casiola.Still enjoyed the property though. DEFINITELY would rental there again.